I’ve been in a lot of meetings lately. But it’s a good thing. Meetings mean tables … and we love tables. 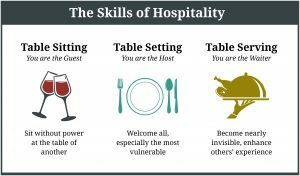 As part of our fellowship with Street Psalms (www.streetpsalms.org) in Tacoma, we are digging into the concept of Table Sitting, Setting and Serving. It’s a philosophy of ministry that is rooted in the Biblical concept of Hospitality. We’ve been doing it for years but now we have the beautiful theology behind it. It starts with Table Sitting: going to another group’s table to listen and learn. Schools, churches, agencies, nonprofits, businesses, the shelter, the streets. We do this a lot. Then comes Table Setting: hosting tables so that diverse people and networks can collaborate. For us, the two main tables are the monthly CaN (Churches as Neighborhood) Centers lunch and the four CPT (Community Partnership Team) meetings. Please join us—free lunch and effective strategies for healthier kids, families and neighborhoods! And finally, there’s Table Serving: rolling up our sleeves to help other nonprofits and ministries with strategic planning, fundraising, events, conflict resolution and capacity expansion. Examples include Salem for Refugees, IKE Box, Hope Station, Salem Free Clinics, the NW HUB, Interfaith Hospitality Network/Family Promise, Salem Dream Center, and the Community Homeless Connect events. There are lots of good causes. And lots of good organizations to tackle each cause. This creates a challenge in Salem-Keizer: plenty of left-hands and right-hands doing good, but often with (unintended) duplication and competition. Too many branded messages. Too many events. Donor and partner fatigue. The answer is Collaborative Impact. Have you noticed how CASA/Every Child Oregon, Liberty House, Family Building Blocks, and Catholic Community Services/Fostering Hope have banded together for the health and well-being of children? Four nonprofits working in unison to educate the community, recruit volunteers, improve systems and generate outcomes? You will see a similar collaborative coming together called Strong Families, Safe Neighborhoods. And yet another that will address the strength of our schools and educational outcomes. The CaN Centers and CPTs are additional examples. That’s a lot of tables. Coming together. Think of your own tables … the tables at which you sit, set and serve. How might they invite? Engage? Serve? Collaboration is not easy, but it yields the higher out-comes. Imagine one church, all alone, trying to host dozens of homeless families each year. Tall order. But when more than 20 churches band together—i.e. Family Promise/IHN—to share mission, fellowship and resources—it happens.